Kids enjoy their summer vacation to the hilt. At least mine do. Whether we travel or not, whether we do interesting things or not, both the children manage to keep themselves thoroughly occupied. Udai, now eight, lives in an imaginary world created by the books he reads all day. Aadyaa is at that wonderful age when she can create an imaginary world all by herself. Along with her friends or even alone, she created interesting plots through role play. Her characters have outlandish names. She incorporates all the activities, mannerisms and attitudes she observes in adults around her and parodies them in her little games. It is fascinating to watch and being a silent observer has many rewards, including a priceless insight into the innocence and creativity that children inherently possess. A favorite game they play is what she calls ‘Ram-Ram’. 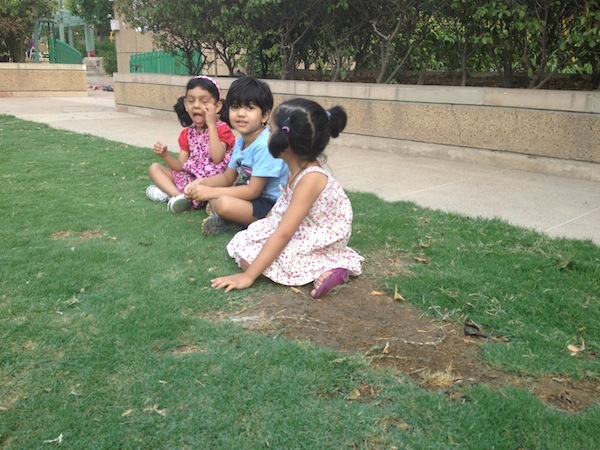 Last year in playschool, her class performed an adaptation of the Ramayan in rhyme form. The story had an interesting twist, with Ravan apologizing to Ram in the end for all the mess he created! 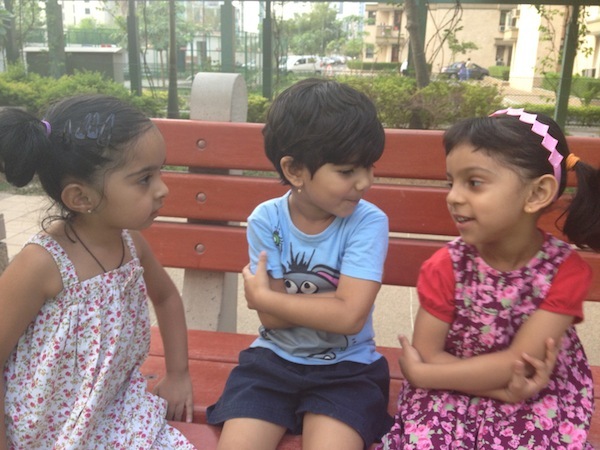 Aadyaa and her pals recreate several adaptations of the barebones Ramayan plot. In the park downstairs, sometimes there are three little girls all playing the role of Sita, with one Ram in tow. The other day, they tired of the the kidnapping and decided to enact the bit about Ram, Lakshman and Sita leaving for the forests and building a home for themselves. I was sitting nearby and was told to play a two-bit role of Dashrath and weep while they walked away into the jungle, holding their imaginary bows and arrows! Another typical game, common to many little girls, is the routine of feeding, bathing and clothing all her imaginary children, ten of them no less! In her head, they range in age from a new born to some seven years. That she in only four does not bother her a bit! Their names are so bizarre- the oldest is Turkish (we took the airline to Barcelona a year ago and the name has stuck!) and the youngest is Saaha (we cannot give away her stuff, it has to be all kept for the baby)! When Udai was about this age, he had an imaginary girlfriend called Alisha Shopshish, who lived in Bangalore and visited him in a Posche! Many of our friends and relations still fondly remember this phase. It fascinates me to see how their real worlds and their imagined ones come together to create such well-rounded fantastic plots, how they can sustain and feed the same plot for weeks and months on end, how they never tire…Yet we adults tend to accuse kids of low attention spans because our idea of good attention span is playing with blocks for 30 minutes in a row! I can just hope their imagination remains ever fertile even when they grow up. I’m hoping that, as a parent, I am able to provide an environment conducive for creative thinking and free expression for many years to come! Ram-Ram begins- Who plays who? Aadyaa is Ram. The other two play Sita. 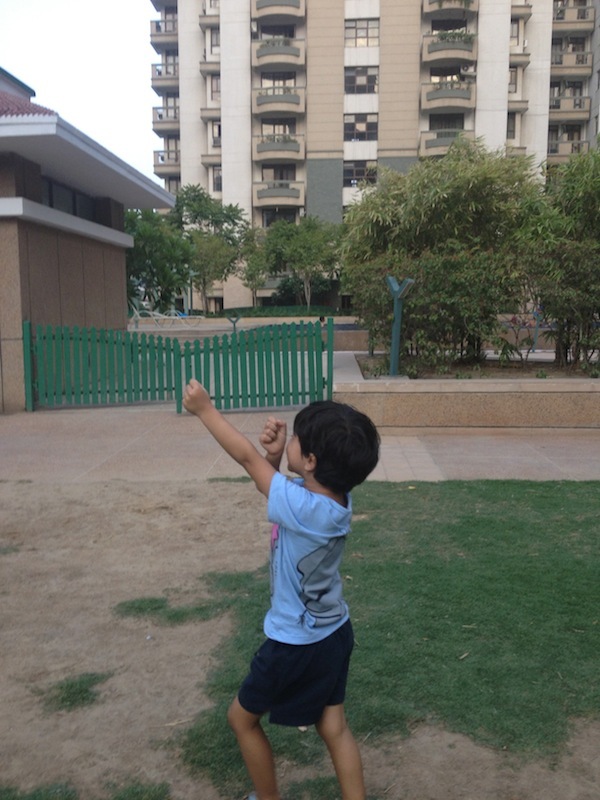 Ram is off with his bow and arrow to hunt for food….true vanvaas this! Posted on June 12, 2012, in Personal and tagged children, creativity, fantasy, imagination, narrative, stories. Bookmark the permalink. 4 Comments. Lovely piece Mukta. It is indeed fascinating what imaginary worlds exist out there when we are young. And these are absolutely priceless memories for us as parents too. my mother still has some of the stories that I wrote when I was that age. All of them began with, “once upon a time…..” :). I asked her to throw away such junk a few years ago and she almost got mad at me and said, “this is my treasure – what I have earned in a lifetime (my jama punji)”. I was speechless. Great piece of writing Mukta … I was thinking on writing about the same and posting a lot of kiddie pictures myself … now that you have inspired me, I can’t wait to contribute. Reblogged this on the adventures of a pseudo mom.